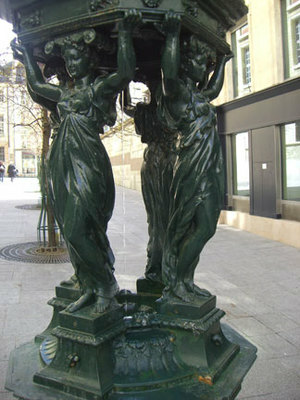 I’ve seen these ornate drinking fountains decorated with green goddesses all over Paris and recently learned their history. They are called Wallace fountains, named after Sir Richard Wallace, a British philanthropist who donated 50 of them to the city in 1872. 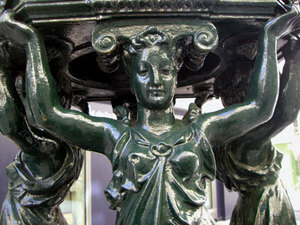 (An additional 36 fountains were later installed by the city.) The destruction of many of the aqueducts in the city by the Franco-Prussian War and the uprising of the Paris Commune left the poor without access to free drinking water. Wallace designed them and collaborated with sculptor Charles-Auguste Lebourg to have them built. The goddesses represent Simplicity, Temperance, Charity, and Goodness. At one time the fountain had a tin cup to scoop or drink the water with but for sanitary reasons they have been removed. You can fill your water bottle or refresh your face with a splash of the fresh water blessed by the goddesses during the spring and summer (the water is shut off from November to February). The one below is on the Allee de Justes in the 4th arr. off rue Pont Louis Philippe. For more information and a list of the locations, click here. Thanks for the info. I've used the fountain at Pont Neuf so many, many times. In my days of poverty it was a life-saver. I came to Europe expecting every stop to be wonderful, except for Paris,(As i had found the Parisians to be difficult on previous trips) Not only did I find them to be soo gracious, but going on the walking tour with YOU, game me a whole new perspective...The back streets we walked through had such charm and beauty, and the people you knew were so friendly... I can honestly say, I LOVE PARIS ! Did they removed the fountain on your street when they de-Haussmanized it, Richard? I cannot recall. We've spent more time sitting out there. 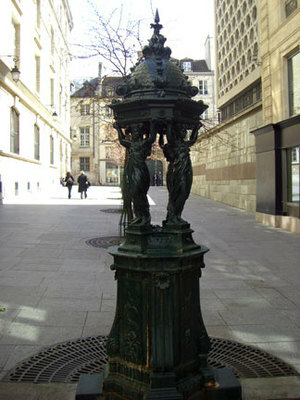 My favorite is probably the "applique" fountain near the Arenes de Lutece in the 5th.